Spirit photography and child mortality in the 19th century. Among the creepiest of creepy 19th-century cultural artifacts, postmortem photographs of children have all the awkwardness of staged moments of family togetherness combined with the horror of a gathering of the unburied dead. Some are so off-putting, it’s easy to forget the practical purpose they served. Before the 1838 invention of the daguerreotype, only those with the means to hire a portrait painter would be able to preserve the features of a lost loved one. With the rise of the comparatively inexpensive art of photography, many more grieving parents were able to hold on to images of lost children after they had been lowered into the grave. 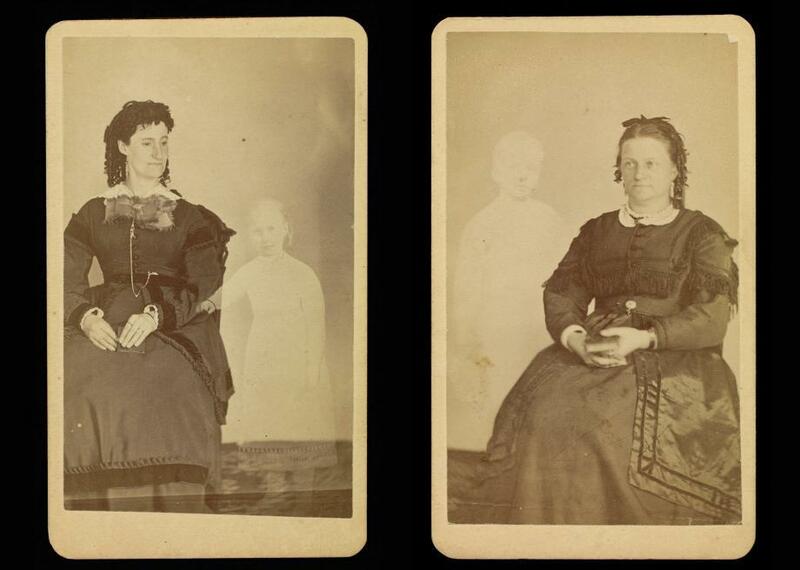 Beginning in the 1860s, parents who wanted to see deceased offspring again but could not bear posing tiny bodies in their Sunday best had another option: a visit to a so-called “spirit photographer” who took portraits of the living in which the souls of the departed could supposedly also make an appearance. First in Boston and then in New York City, William Mumler and his spiritualist medium wife Hannah made photographs for the bereaved that offered a haunting solace to many. 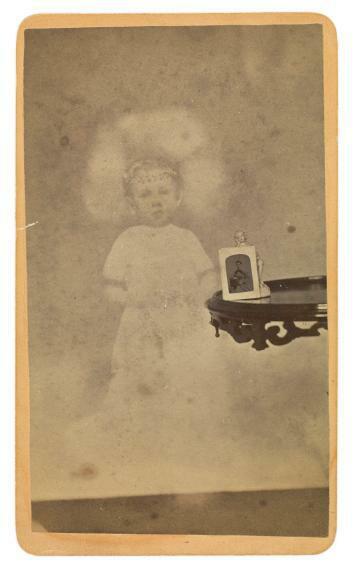 Child “spirit” with photograph and figurine on table. Mumler’s images today appear so far from believable it’s difficult to understand how anyone—even mothers and fathers undone by loss—could have fallen for them. Yet during this first generation of photography’s widespread popularity, the possibility of freezing a moment in time remained so close to miraculous that the further miracle of capturing a lingering soul seemed perhaps slightly less absurd. Moreover, with child mortality around 20 percent—meaning that 1 out of every 5 children would be dead by age 5—infant spirits remained in many families’ thoughts; spirit photographs offered a means to nudge them out of memory and into view. Such testimony proved both poignant and effective. Mumler was acquitted and for a number of years continued to take spirit photographs, including his most famous image, which showed Mary Todd Lincoln being embraced by the ghost of Abraham. Though it is said that she believed in and treasured this photo, her appreciation was tinged with disappointment. She had hoped she might also have a picture of the spirit of her dead son Willie.